Owning a horse is a rewarding experience. However, a major question arises while buying a horse is where to keep your horse. Many of the horse owners would love to have a bit of space in the country where they can take care of their horses. Of course, not everyone has an idyllic little country estate, or ample of time to spend feeding, mucking and turning out the horse. As a result, several horse owners like to keep their horses in a stable. This might seem like an easy option but there are several aspects that a horse owner needs to explore before selecting a horse boarding facility. Cost and location are two important issues that a horse owner must consider when seeking a boarding stable. The monthly cost of a horse boarding facility ranges from $100 to $1000. The cost usually depends upon the quality of services provided. For instance, if you want a quality stall board for your horse with stall cleaning, feeding/watering, and daily turnout, then the cost can quickly rise high above the estimated price. There are also some stables that offer additional routine care like blacksmiths, immunizations, and deworming programs, which can add up to your monthly boarding fee. You have to determine which features are necessary for your horse and what you can afford. Secondly, it is important to consider the location of the boarding facility. The stable should be located maximum 30 minutes away from your house so that you can visit your horse regularly. In this way, you can ensure that your horse is given proper care. However, if you are living in a metropolitan area, then the boarding facility will be located far away. In such a case, you can spend weekends with your horse, rather than visiting daily. You can search the Internet and your local yellow pages to get a decent list of stables in your area. You can also get referrals from other horse owners, friends, veterinarian or farrier. Size: Firstly, check the size of the stalls. The size of the stall depends upon the size of your horse. A standard-size horse needs a minimum 12-by-12-foot stall. But a larger horse will require larger space to stretch out while lying down. Moreover, the stall doors and the ceiling should be high enough so that horse can keep its head up and to avoid any risk of head injury. Hygiene: Stalls should be clean, dry and should smell fresh. Cleanliness is a top priority, especially if the horse spends most of his time in the same stall. 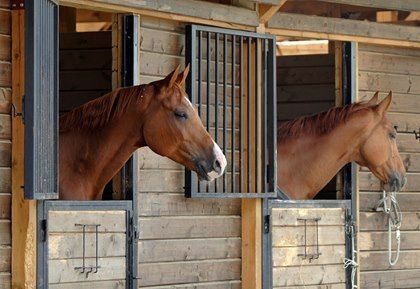 Unclean stalls attract flies, mosquitoes, and ticks that can be the carrier of several diseases so find out whether the stalls are cleaned daily or not. Ventilation: Ventilation is an essential aspect of any boarding facility. Adequate air circulation promotes healthy equines and prevents them from allergies and infectious respiratory diseases. As you walk through the barn, note the ventilation. Take note of how the air smells. Does the air smell clean, or does it smell damp, musty or stale? Quality: Inspect the quality of the hay and grain being fed. Ensure that the hay is clean, fresh and not dusty. Inquire where the hay comes from and how do they store the feed. Ask what different grain options the boarding facility offers and check on the brands that the facility uses. Quantity: Each horse should be fed according to their nutritional requirements, age, size, and workload. Inquire whether the horses get all the food they need or if there is a quota. Frequency: Horses should be fed at least twice a day, and the same schedule should be followed each day. Ask how often they feed horses and what times of the day feeding is done. Water: Horses should be watered at least twice a day. Ask how often the buckets are cleaned and refilled with fresh water. Next, you should take a look at the pasture. Quality and quantity of grass: As you walk the pasture, inspect whether the pastures have plenty of grass or too little grass. Check whether the grazing area is free from dirt, sand, mud, pebbles, poisonous weeds or dangerous objects that could harm your horse. Shelter: Pastures should have run-in barns or trees to offer cover from several elements (rain, hail, snow, sun). Find out whether the pastures have adequate shade and shelter for all the horses. Are these shelters large, clean and well ventilated? Do they have access to fresh and clean water? Drainage: Are the pastures well drained, or do you see standing water during wet weather? Mosquitoes and insects breed in standing water and can transmit dangerous diseases to your horses. Pastures should have a proper drainage system to eliminate standing water. Fencing: You need to check the material and condition of perimeter fencing. Fencing should be at least four feet high. The fencing material should be sturdy, horse safe and in excellent repair. Next step is to walk around and chat with as many other people there as possible. The stable manager: Have a long chat with the manager and ask them about his experiences with horses. Ask about general barn policies, fees, and conditions. You should also discuss topics such as vaccination and de-worming schedules, first-aid/emergency procedures and other issues that relate to your horse’s health and well-being. Staff behavior: The staff of the facility should be experienced, knowledgeable and reliable. Interact with the staff, and observe how they treat the horses. Do they appear sensitive to the needs of the horses? Other clients: Finally, you have to talk to the other horse owners to get their reviews about the facility. You will receive tons of information about the facility, which help you to understand the personality of the stable. It is important that the personality of the stable suits your personality. After all, you will hopefully be spending much of your free time among these people. Horses: The horses in the stable should appear healthy and happy. It is an indication of how they treat the horses. There are several things to consider when selecting a boarding facility for your horse. Finding the right boarding stable can be a time-consuming and challenging task. But with little hard work, forethought, and planning, you can make this task easier. I am an enthusiastic freelance writer who loves simplifying the most complex of ho-hum subjects and making them interesting reads! I also enjoy travelling, and wish to trot the globe someday!